Done. If it's not decorated yet, it's not getting decorated. 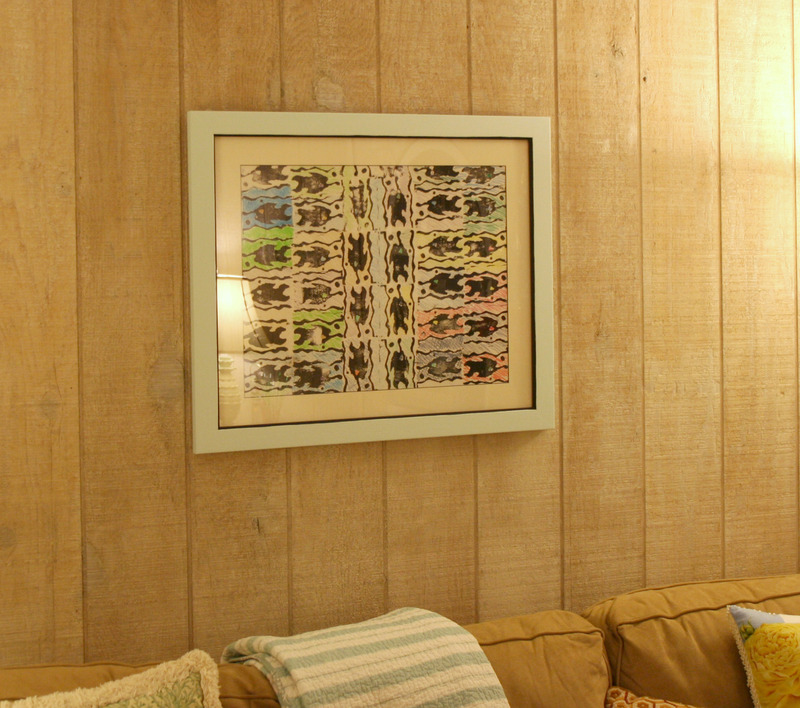 Last on my list was to wrap the wall art in the family room. It's a fun look, I like it. It says "you bought too much gift wrap again". Before and After. It's easy, it's fun. Just be sure to use painter's blue tape on the back so you don't mess up the frame job. 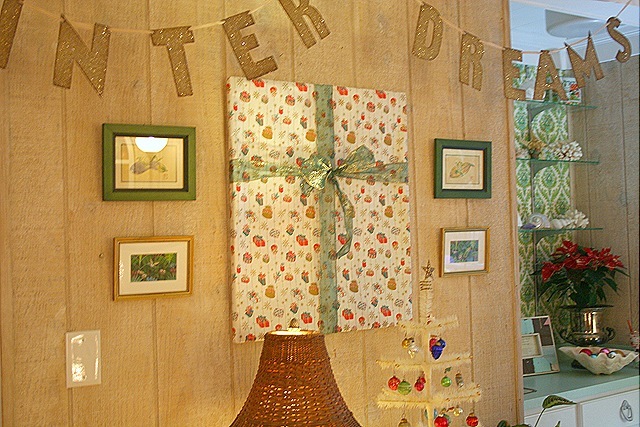 hmmm….this gives me an idea….that vintage wrapping paper that I have! YES – I will use some of it to wrap my package on the wall so when everyone has finished opening their gifts and my cherished vintage paper is rolled up in a ball in a trash bag….I will still have some to enjoy on the wall! Good Morning, I love the way you decorated the pictures, very cute & different..
thanks for sharing, and have a wonderful Christmas…. How cute and it makes your whole house a present! So festive! 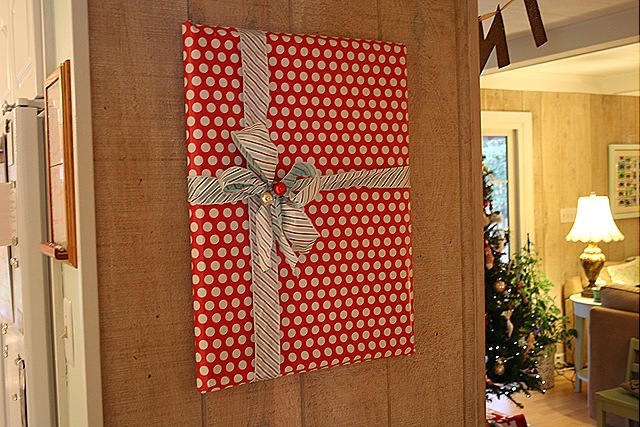 What a great idea for some of that wrapping paper you just LOVE!! This is a fun idea!! It’s beautiful, Suzy! I shall have to remember this. 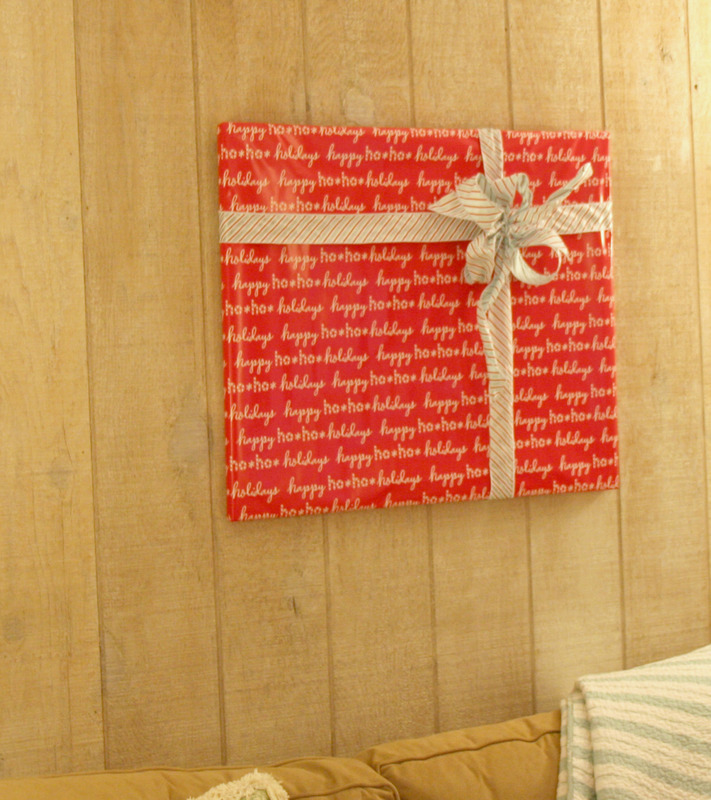 Love the idea of wrapping up the wall art! So cheerful and festive! Merry Christmas! Looks great. I did this, too, this year — to a set of four asian-style panels in my dining room. I didn’t do a bow, but did fabricate thick “ribbons” from a contrasting paper. Then, I used them for the Christmas cards that came in the mail — it looks really cool. I would post the project on my blog, but I can’t find the thingy that connects my camera to the computer, drats! Happy holidays! OMG, what a creative way to add Christmas decor to all parts of your home, without existing artwork clashing with your Christmas vibe!